(CNS): Following the tradition of also helping young people to forge careers outside of the legal profession local law firm Maples and Calder has awarded scholarships to four young Caymanians to study economics, management, veterinary medicine and computer science. 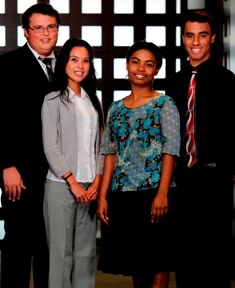 Maples is one of only two law firms in Cayman that has a non-legal scholarship programme. The programme, which has been running for over ten years, provides partial funding for school expenses each year until the completion of the student's further education. It is intended to supplement the student's financial assistance package. This year’s recipients were Priscilla Brown, John Fawkes, Sheena Jackson and Jonathan Tatum. "Their individual dedication and passion to achieve excellence were key factors in our scholarship selection process," said Henry Smith, Global Managing Partner at Maples. "Every young person should be afforded the opportunity to further their education. We're delighted to assist these talented students with achieving their goals." Priscilla Brown has begun her tertiary education at the University College of the Cayman Islands where she studied Business Administration. The Maples scholarship will give her the opportunity to complete her final years of tertiary education at the University of South Florida where she will major in Management. Aside from allowing him to open John Fawkes his own Stock Brokerage and Venture Capitalist Firm in the Cayman Islands he will be attending university in the UK to study Economics. Meanwhile, Sheena Jackson will be completing her tertiary education in Computer Science at the University of Waterloo to study Computer Science. Jonathan Tatum with a lifelong interest in reptiles will be studying at the University of Missouri to earn a degree in pre-veterinary medicine. The Maples non-legal scholarship is offered on an annual basis and is available to Caymanians who wish to pursue an undergraduate or post-graduate degree in any field. The firm also awards annual legal scholarships.